The Green movement of buying more earth friendly products, recycling, using reusable bottles and bags has hit in our house for a while now. There are some things that will not happen (cloth diapering since my youngest is already 2), but we are trying to do as much as possible. I have been impressed recently with other places that are doing the same. 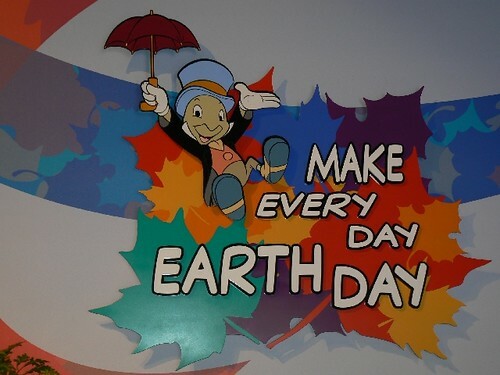 This is a sign that we snapped a photo of while at EPCOT in May. I loved the display with information for people and wished that I had more time to stop and check things out. This weekend while visiting Six Flags something caught my eye in Wiggles World. I went to check it out and HAD to take a photo. Yes, this was strategically located next to the regular garbage can. 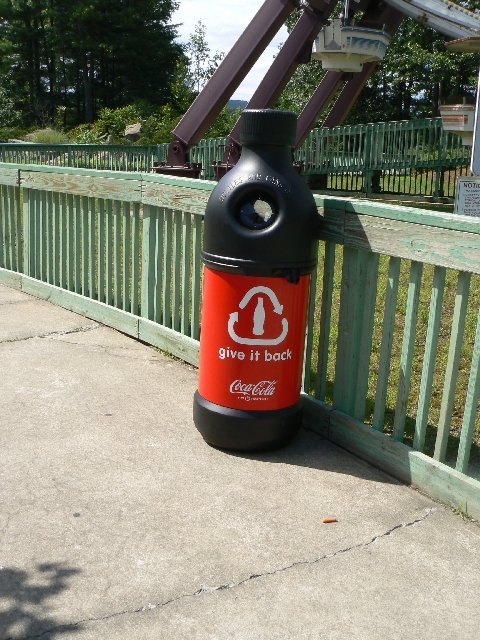 The Coca-Cola shaped bottle is actually a recycling container for visitors to place their empty soda bottles in. Love it! In fact, I kept looking for different places where they were hidden within the park. Here is another one that I found. 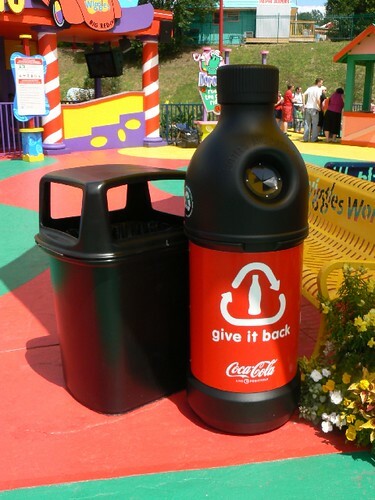 I think it is great that Six Flags and Coca-Cola are teaming up together to help our planet. They could simply have their trash cans and not bother, but they are going the extra step to help everyone. Kudos to both parks for helping us to be more Green!